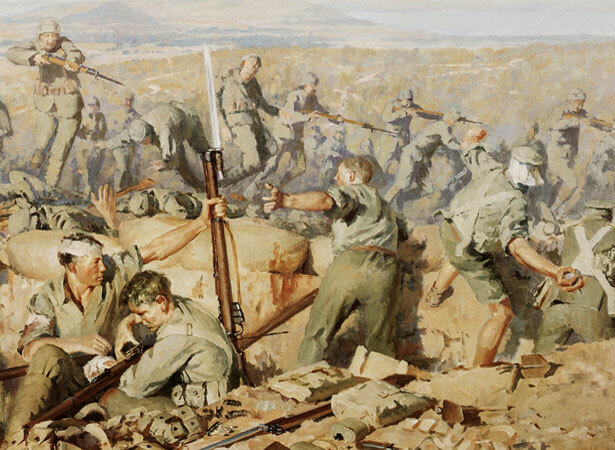 Two columns of the New Zealand Infantry Brigade carried out the attack, which began on 6 August. The operation started well, but delays meant not all the infantrymen had reached Rhododendron Spur by the time the assault on the summit started next morning. After the Auckland Battalion tried and failed, Malone insisted that the Wellingtons’ attack should be delayed until after nightfall. The Wellington Battalion occupied the summit before dawn on 8 August. With sunrise came a barrage of fire from Ottoman Turks holding higher ground to the north. A desperate struggle to hold Chunuk Bair ensued. By the time the Wellingtons were relieved that evening, only 70 of the battalion’s 760 men were still standing. Malone was one of the casualties, killed by an Allied shell about 5 p.m.
Ottoman forces recaptured the position on 10 August from British troops who had relieved the New Zealanders. We have 21 biographies, 40 articles, related to Wellington Battalion captures Chunuk Bair.